If a pump is produced in compliance with the ATEX directives this will be visible on the pump type plate. 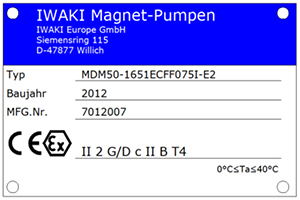 As the manufacturer, IWAKI Nordic A/S is responsible for a correct EX marking according to the regulations in the ATEX Equipment Directive 94/9/EF. This marking is visible on the product type plate, where you eg can see in which zone the pump can be used. On the type plate, the pumps are further labeled with the temperature class, which indicates the pump’s maximum surface temperature in operation (including a safety factor). The type plate is also labeled with the atmosphere and with an explosion group. The marking applies to ambient temperatures 0 to 40 °C. *: The examples in the overview are indicative. The pumps must also be marked with any restrictions on use. If the device is labeled X, it means that there are special requirements for the installation, etc. Restrictions and conditions can be found in the accompanying guide.